This pile is being transformed on a weekly basis. 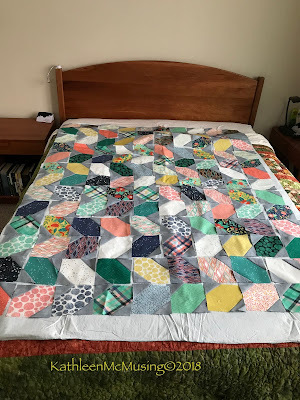 I am making a Squiggles quilt following along with Christa Watson. Its not too late to get in on the fun, especially if you have the right precuts hanging around. 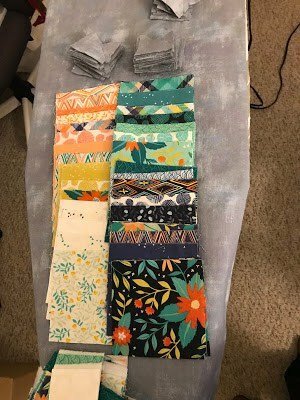 I won this grouping of fabrics a few months ago and it seemed to work quite well with this pattern. So, week 1 goal was met. These fabrics are all cut. I used my new Sizzix to cut the squares and half square triangles. Here’s the pile of half trimmed and half not trimmed blocks. 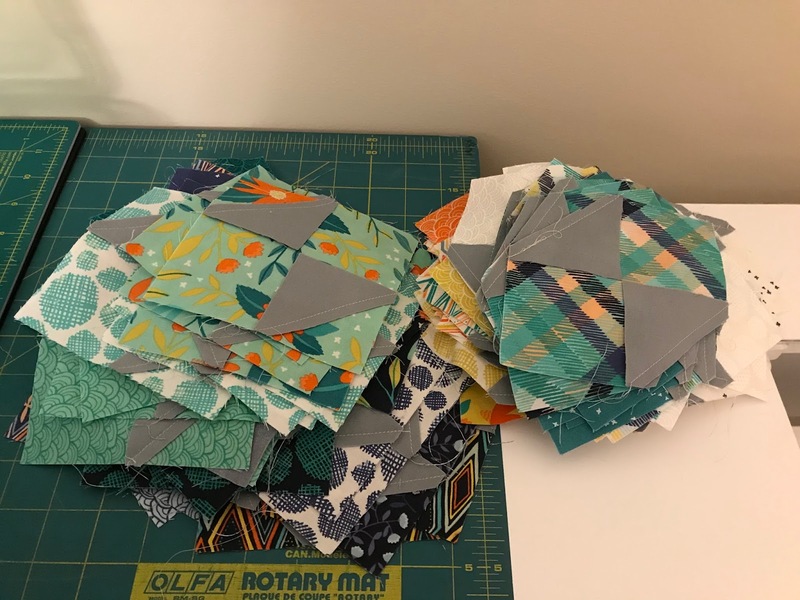 I think I have about 132 blocks and will make a 10×13 quilt. I was a little short of what the pattern calls for, but decided to go ahead. I could add a little grey border if I wanted it a little bigger. Honestly, I found the precut to be pretty helpful, but there are always still some inaccuracies. As you can see the triangles have the dog ears trimmed, so I didn’t have to draw the line. I trimmed with my scissors. Week 2 – make the blocks – is complete. Week 3 is assembling the quilt and by the end of today I hope to be making some progress on that. Last night I started laying it out and today I finished (vinyl tablecloths can be carefully folded and most pieces stay in place on the flannel back. This afternoon I finish laying it all out on the bed – carefully marked the rows and put in little piles. I am taking some time matching things up. It is almost all working out! The first two rows I redid most of the join. It was just off too much. I.AM.PINNING. It is much easier to keep it lined up. Sometimes, I just use my fingers, but today it went better with pins. Who is to second guess why some days it works and some it doesn’t? Holding my breath as I have 9 more rows to go. Kathleen it is looking great. I just finished up putting it together yesterday. Need to find some backing for next week. Thanks, Jan and congrats on finishing the assembly. My backing is on order, so that will be early next week. I have three days to sew, my plan is to do a little each day. 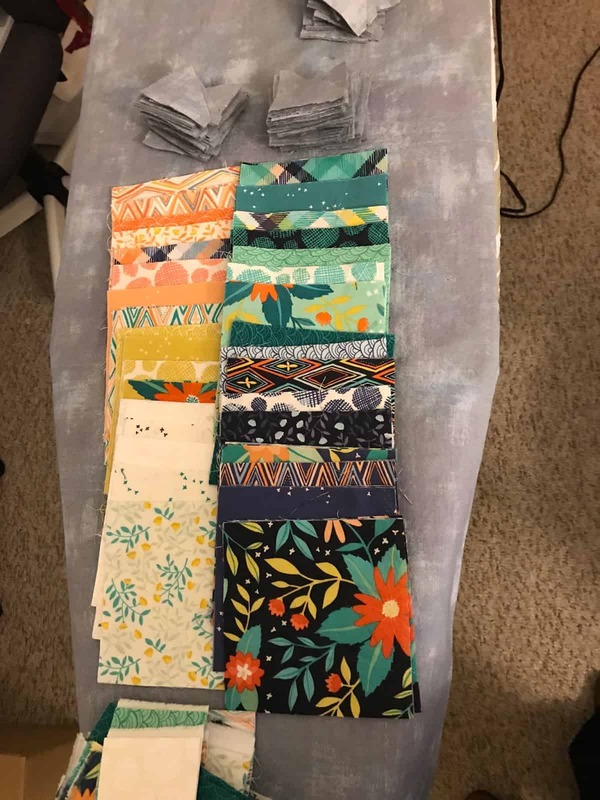 Those fabric do look great together and your progress is awesome. Congrats on having a die cutter to speed things up! It was a great collection by Moda. I went with a Sizzix which allows you to cut more and cheaper entry point. I may need to upgrade, but for now I think it will do what I need. I've made blocks like that in the past for a quilt….quite fun. I agree, Marsha, they are fun. Also, it was a good use of a set of fat eighths I won last year. I believe that it will be a charity quilt in about 5 weeks – if I keep up! Ohhh, I love your grey background! The color combo is great, too! Thanks, Nancy. I love the Moda Grunge line and it worked well with this Moda line. I like the gray background color! It's coming along really well. I'm still sewing away on my blocks. I'll be laying mine out on a bed too; no wall space big enough! Thanks for the highlight to visit my blog! Thanks, Wendy. I am pleased with my progress. None today as I was out "fabric shopping" – yikes! The good news is that it was for a class with Paula Nadelstern so very specific. Not sewing during the day tomorrow but Friday and Saturday are unscheduled. Its back is arriving so I should get my hands on some batting. 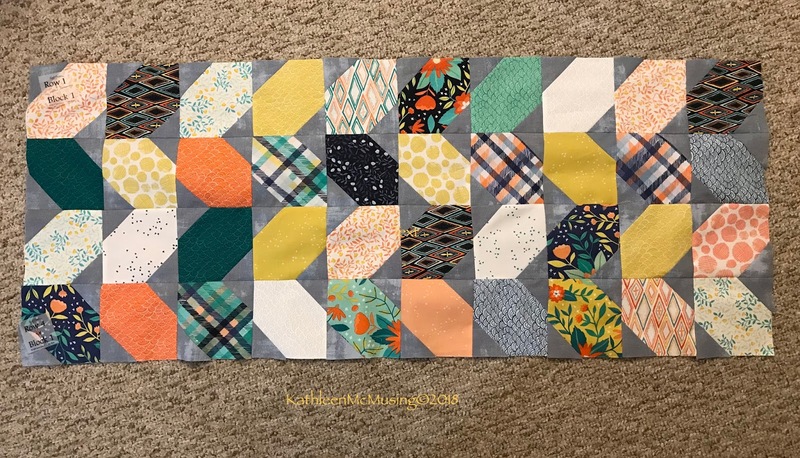 Your colors are great on this quilt! I use a super fancy vinyl tablecloth, too 🙂 Those stitch and flip corners can be tricky to match up, and I'm always happier when I pin them. But pinning is a pain! Thanks, Louise, but really the designer of the line did the work on the colors! I was just fortunate enough to win the fat eigtht collection. And, yes, pinning was a pain but the only way to go! It’s funny about pinning but those triangles just wouldn’t cooperate. Sometimes the tools win! I love the way this is coming out! The fabrics and colors are speaking to me. Thanks, Jennifer. I won them last year on won of the blog hops. I think a benefit quilt is a nice way to return the gift!